School is starting around the country today for many children and I know one BIG stressor for parents is packing and having their children eat a healthy lunch everyday at school. 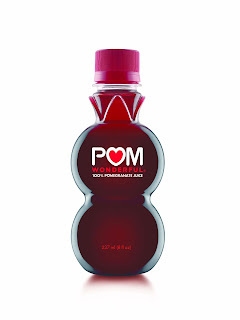 One good way to incorporate fruit into your child's lunch is POM Wonderful’s new 8oz. sized bottle of 100% Pomegranate Juice, which is perfect for school lunches and moms on the go. The new portable bottle is great for the healthy family, offering a single serving of fruit in one 8oz. bottle. Unlike other beverages, each 8oz. bottle contains the all-natural juice of two crushed California-grown POM Wonderful pomegranates—and nothing else. With the new 8oz size, you can enjoy POM wherever you go. My husband loves to grab these 8 oz bottles of POM Wonderful when he gets home from work and is thirsty and I love that he is grabbing for 100% juice instead of 100% crap like pop or other sugary beverages! These smaller 8 oz. bottles are really are the perfect size for any child or adult's lunch box or to grab and throw in my purse for on the go drinks! I love that they don't add any sugar or artificial ingredients - it is 100% juice! Buy It: You can purchase the 8oz size of 100% Pomegranate Juice at grocery and convenience stores nationwide for a suggested retail price of $1.99, joining POM Wonderful’s family of products that include 16oz, 24oz 48oz and 60oz sized bottles.